So, as promised, Monday posts in February are devoted to my romance work. 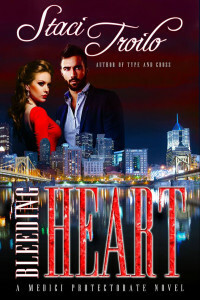 Today, I’d like to take another look at Bleeding Heart, Book 1 of the Medici Protectorate series. The idea for the series came to me from my beloved grandfather, John Naccarato. The 30th anniversary of his passing was yesterday, February 7, so I think remembering him and his legacy is a fitting thing to do right now. When I was young, I used to sit on my grandfather’s lap and ask him to tell me stories. One that really stuck with me was of his father’s birth. My great-grandfather never met his dad. He was the illegitimate son of Italian nobility. 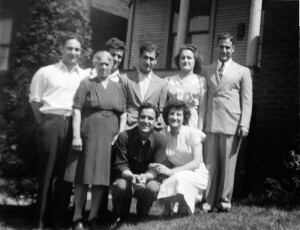 I used to dream that someone from that family would come and take us to Italy, would recognize my family as one of their own and welcome us into their country and their lives. I guess it was my own version of the Princess Diaries. Only my version was steeped in reality but never came to fruition. Several years later, that story of my grandfather’s heritage still lingered on my mind. I was considering different story ideas, and my kids—who I’d told the story to—told me I should I begin with that premise. It sounded like a great idea. And because my kids suggested it, I wanted them to be part of the process. They both hold black belts in TaeKwonDo, and at the time were training heavily with weapons. So the concept of unbreakable daggers was born. And because my kids loved fantasy, a magical element was thrown in. I’m currently writing the third installment of the Medici Protectorate series. The storyworld and plots have been developed for years. (Book 2, Mind Control, is complete and with the publisher. Expected release date is May 20, 2016.) And to me, even though it’s no longer my grandfather’s heritage story, I find it to be the perfect blend between my ancestors and my children. I think my grandfather—and hopefully his father—would love it. It was supposed to be a soft kiss, barely a tender caress. Just enough to whet his appetite and tease hers. But when his mouth met hers, a dark desire awakened in him. He fisted his hand in her hair and pulled her to him, claiming her with a deep, passionate kiss. So, there you have it. A never before released excerpt from Bleeding Heart. If you’d like more information, you can find it on the Bleeding Heart page. If you want to read the first chapter (plus a little more), it is available for free in the sidebar. And if you’d like to read the whole novel, you can find it at Amazon, Barnes & Noble, and iBooks. Oh, and a reminder. Type and Cross and Bleeding Heart are currently on sale, but the price will be going up after February 19. If you want them but haven’t purchased them yet, now’s your chance to get them for under a dollar a piece. Anyway, I’d love to know what you think about Bleeding Heart, the premise, or about alchemy and powers. Let’s talk about it. Congrats Staci on your upcoming book. It is nice to read about the inspiration behind the series. The excerpt is sassy too. I get my children involved in picking my book titles and character names. They find it an exciting treat. And I love the process. Thanks, Stella. It is fun getting the kids involved, isn’t it? Makes it feel more like a family endeavor. Thanks for sharing! Wow, what an interesting background on how your story developed. I loved the combination of history, fantasy and romance that you wove through Bleeding Heart and I look forward to discovering the rest of this series. It’s always intriguing to hear how authors come by their story ideas. It’s only fitting Bleeding Heart started with an idea that came from listening to your grandfather’s stories and that your children interests found a place in the book. Family is the cornerstone of Bleeding Heart. I loved that aspect of it! Mae, my family tree probably isn’t as exciting as you would think. The individual people on it are pretty interesting, but as a group, I’d say we’re pretty typical. I’m glad you liked the history behind the story (and the story itself!). You know me… family is an important part of my life, so of course it’s reflected in my writing.